As an aviation geek who grew up with the world’s busiest airport in my backyard, I was elated to attend the grand opening of the Delta Flight Museum in June 2014. The 68,000-square-foot facility is located at Delta’s world headquarters, adjacent to Hartsfield-Jackson Atlanta International Airport. Housed in two of Delta’s original maintenance hangers, the museum chronicles the history and development of commercial aviation, as well as the history of Delta. Hanger One is dedicated to the propeller era; it shows Delta’s evolution from a crop-dusting service into a commercial airline. Several vintage aircraft are on display, including a six-passenger Travel Air 6B Sedan similar to the the one Delta used for its very first passenger flight in 1929. Hanger Two ushers in the jet age with interactive kiosk and cleverly designed exhibits housed inside luggage carts. 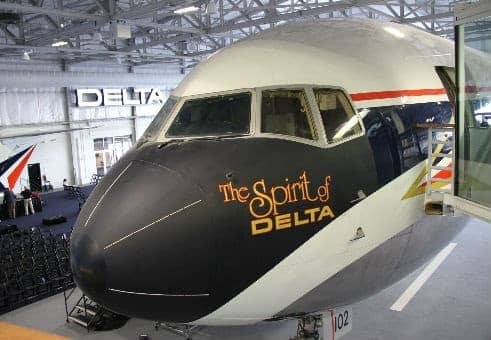 A Boeing 767, “The Spirit of Delta,” is easily the most prominent feature in the hanger, and has quite a story itself. The scoop: While a bad economy in 1982 forced many companies to lay off employees, Delta chose to weather the economic storm—even if it meant posting the company’s first net loss ever. To show appreciation for this commitment, three flight attendants led a drive among employees to raise US$30 million to purchase the plane for the company. Today, business class and the first few rows of coach class remain intact inside the plane. The remainder of it has an impressive display of colorful flight attendant uniforms throughout the ages, as well as a cut away section that allows you to see the pipes, wires and insulation that are normally hidden in modern aircraft. Also of particular interest to me in Hanger Two were the two flight simulators. The first is an old simulator—it looked like one of those rickety, coin-operated child rides you used to be able to find outside of local drug stores. The other is a more modern Boeing 737-200 full-motion simulator. The newer simulator is still used to train Delta pilots. It also is open to the public, making it the only such simulator in the United States. I was told the technology provides the ultimate aviation experience for those willing to shell out US$395 for a-one hour session. Time and money prevented me from hopping in the simulator for anything more than pictures, but I’m adding this to my Bucket List. It’s probably the closest I’ll ever come to piloting a jet. Once the crowds from the grand opening ceremony had dwindled, I discovered that the carpeting in Hanger Two was designed to look like a runway for “The Spirit of Delta.” I also learned that the large letters inside the hangar spelling “DELTA AIR LINES” comprised the original signage from the Delta terminal at John F. Kennedy International Airport in New York before that terminal was renovated in 2013. Viewfinder Tip: If you want to experience the flight simulator at the Delta Flight Museum, be sure to make reservations well in advance. In all, even if you’re not an aviation geek like I, the Delta Flight Museum is well worth a visit. The museum is open Monday-Tuesday and Thursday-Saturday from 10 a.m.-4:30 p.m., and Sundays from noon-4:00 p.m. Admission is US$12 for Adults (ages 18-64), US$9 for Seniors (ages 65 and over), and US$6 for Youth (ages 5-17). It is free for children 4 and under.